The painting Expedition, of Sir John Franklin’s HMS Erebus and Terror, was unveiled at One Ocean Expeditions’ headquarters in Squamish, B.C., on March 9. The original 36" X 50" work by artist Christopher Walker was created with the help of Franklin ship expert Matthew Betts, who provided technical assistance and historical references. 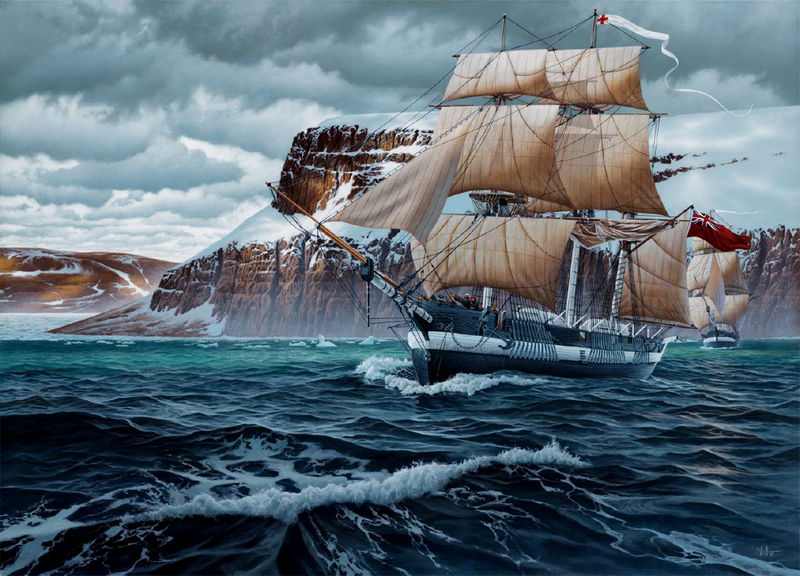 Walker chose to depict the Franklin expedition ships arriving at Beechey Island (prior to when they were beset by ice) and in such a way that depicts the determination, gallantry and hope of the expedition, as opposed to the adversity, peril and struggle more typical of portrayals of the undertaking. The painting, says Walker, is dedicated to the 129 men of the expedition who sacrificed their lives to bring a better understanding of the Arctic to the western world. Proceeds from the sale of the painting, which will be soon be made available as full-size canvas prints as well as 23" X 30" archival watercolour prints, will be donated to the RCGS. 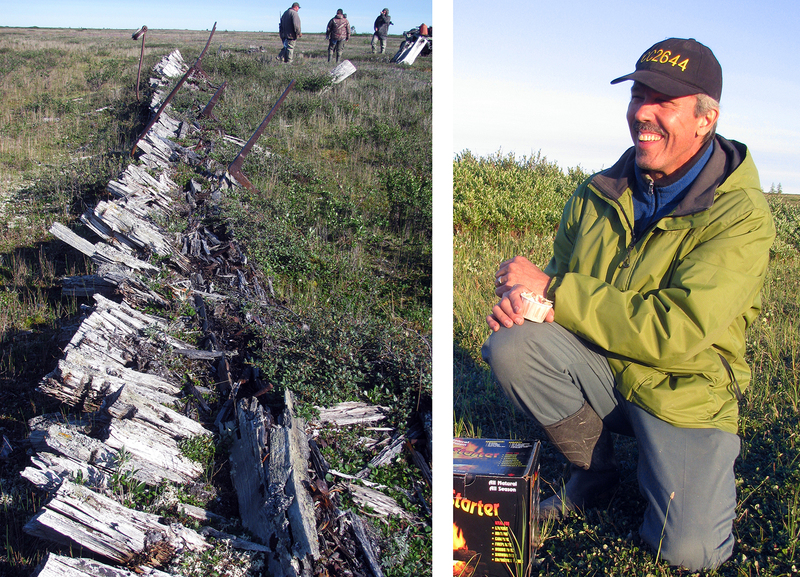 When Jean-Luc Pilon, curator of central archaeology at the Canadian Museum of History, was carrying out his doctoral research in the Fort Severn, Ont., area in the early 1980s, locals told him about shipwreck sites west of Fort Severn along the shores of Hudson Bay. At the time, he was focused on documenting the region’s ancient history, but this past August, he returned to the area with University of New Brunswick Master’s student Katherine Davidson and then-Fort Severn deputy-chief Chris Koostachin to view these remains, which are located about 60 kilometres east of the Manitoba border. The trio logged 192 kilometres and documented six marine-related sites. Viewing Ontario’s coastal tundra and the endless expanse of the Hudson Bay shoreline with its myriad flocks of shore birds was, says Pilon, simply amazing. This incredible experience was punctuated by polar bear sightings — not one or two, but 37, including at least two mother and cub groups. On this return to Severn the team followed ancient raised beach ridges and had the season’s biggest and brightest full moon as its guiding beacon. Work continues on the identification of the beached wrecks. In late October 2017, NASA Astronaut Randy Bresnik made a request from the International Space Station that people across the globe participate in an “Around the World In 90 Minutes” event. 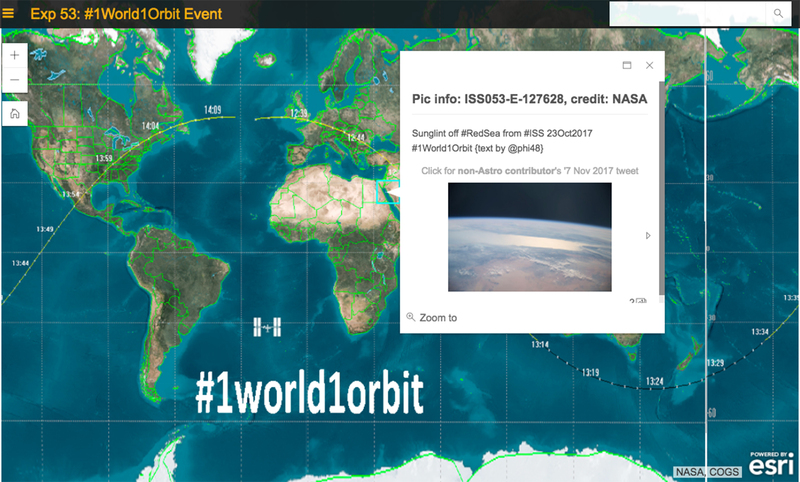 During one orbit of the ISS, he and other astronauts took a series of images of the world for future use, while hundreds of people shared images from their own locations via twitter, Instagram and Facebook using the hashtag #1world1orbit. RCGS Fellow Dave MacLean, of the Centre of Geographic Sciences in Lawrencetown, N.S., orchestrated a number of his GIS students to help map those images (using technology that they learn in class). The results are on this online interactive map. To help spread word about the mapping effort, the astronauts gave the project a shout-out from space. 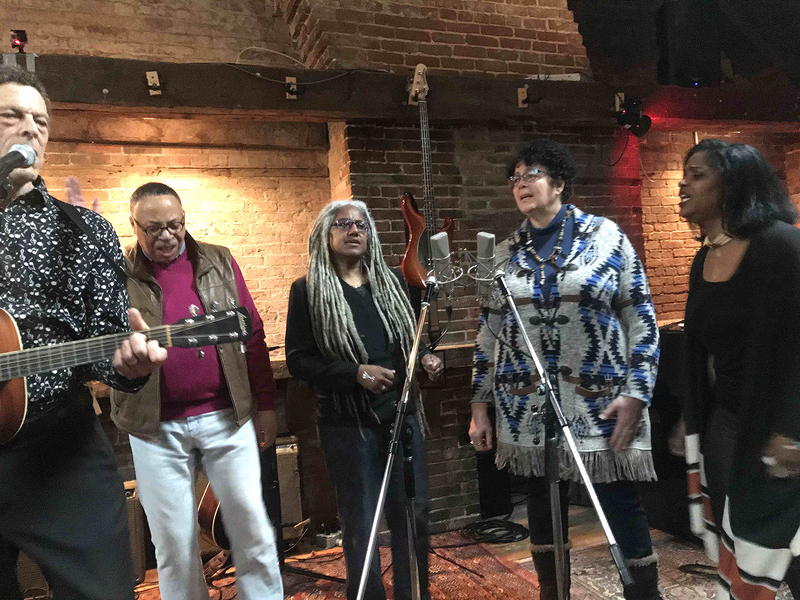 Former Canadian poet laureate George Elliott Clarke and the other members of The Afro-Métis Nation — a group of Halifax musicians and poets of Black and Indigenous ancestry — gathered in a recording studio from February 15-18 to record The Afro-Métis Constitution. The new album of 18 songs, Clarke told the CBC, is literally “a statement through music about our existence as a people with a particular heritage, which is part Indigenous as well, of course, as African” — two historically marginalized groups in Nova Scotia. Clarke’s ancestry includes the Black refugees who arrived in Nova Scotia after the War of 1812 as well as Mi’kmaq heritage. Among the other members of the group are Shari Clarke, Sugar Plum Croxen, Shelley Hamilton, Russ Kelley and Chris White, the nephew of renowned opera singer Portia White. 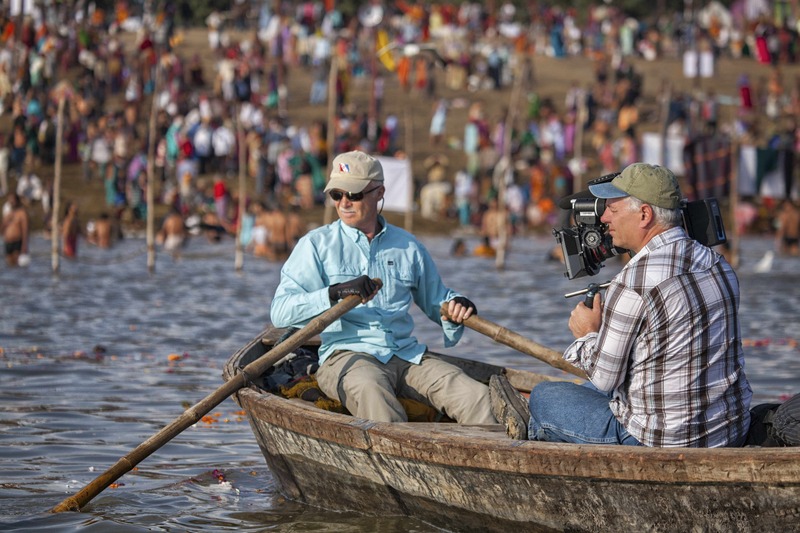 The Canadian feature documentary RiverBlue was honoured at the World Water Forum, the world’s largest water-related gathering, in Brasilia, Brazil, from March 18 to World Water Day, on the 22. At the forum’s Green Film Festival, renowned Canadian river conservationist and paddler Mark Angelo and the other makers of RiverBlue were presented with both the AFD Best Film Award and a special edition of the prestigious Green Drop Award, which honours the film from the past year that best promotes sustainability. This special edition of the Green Drop award — a statuette crafted by master Venetian glassmakers and typically presented as part of the Venice Film Festival — signifies the need to better care for the planet’s environment and its water resources. RiverBlue chronicles an unprecedented three-year around-the-world adventure by Angelo, during which he uncovered and documented the extensive pollution impacts of the fashion industry, ranging from denim to leather to fast fashion. The fashion industry is the second-most polluting industry on Earth, and has taken a major toll on hundreds of the world’s great waterways. The Sedna Epic Expedition is mounting its third dive and snorkel expedition in the Northwest Passage — this time in partnership with Adventure Canada aboard the Ocean Endeavour. The expedition departs Qausuittuq (Resolute), Nunavut, on August 6, sailing to Mittimatalik (Pond Inlet) and across the Davis Strait to western Greenland. Sedna’s experiential ocean outreach program for Inuit youth and Elders will take place in Qausuittuq and Mittimatalik, where Sedna’s members will showcase marine species in mobile aquariums and lead underwater robot-building workshops and snorkel safaris, bringing the ocean to eye level for Inuit communities and Adventure Canada travellers. Advance planning will engage community members in Sedna’s ocean outreach and mentorship programs designed to empower Inuit girls and young women. Adventure Canada is sponsoring the participation of Alexia Galloway-Alainga and Kristen Ungungai-Kownak, two mentees and Inuit throat singers who participated in Sedna’s 2016 expedition to Iqaluit. Dive and snorkel operations will be managed by Newfoundland-based Ocean Quest Adventures, which is operated by RCGS Fellow Rick Stanley and has been a Sedna expedition partner since 2014.